I have a battery of stories to tell, too many for a single blog entry. I will share them in stages, with the intention of 4 stages of publications. I had to come back to this entry a couple of times, it was too emotional to get out, in one bite. Landed in Portugal after a good nights sleep, c/o Isabel’s connections at US Airways. Had a row of seats to myself on the 9 hour flight and got two long naps before we landed. Had a day of dealing with jet lag in Lisbon, getting some great sights and sounds of a colorful city. Went for a couple of walks and found an Indian food spot and had some conversations with young people. Woke up on day 2 and rented a car. What a great decision to overland from Portugal to Spain via a rental car. The scenery of all the agricultural lands was stunning, and it gave all kinds of great ideas for future trips. My wife would have loved all the gardening going on in rural Portugal, and there were vineyards that cover nearly every unused piece of the Portugese landscape. There was a gas station that cultivated grapes that literally overhung the door that we walk into pay for our fuel. I got some great ideas for some long bike rides after the race as I drove through Portugese National Parks, as I have three days of travel in Portugal once we are done. 2) I am here as a competitor, not as an observer. I am fourteen months removed from a party at our house that was a precursor to this event. Someone slap me silly, please. I went to bed late that night and did my first race on inadequate sleep. Amazing how this crazy start has evolved. “I just got into duathlon 14 months ago, Ma’am,¨ would be my common response. Women were more likely to approach and greet me than the competitive natured man in this competition. Team USA Members: Mike, William, Isabel, me, and Eileen, left to right. What I avoided was this answer…”I used to be a fattened middle aged white guy who thought he could do everything he did at age 20 even though I am 48. That lifestyle got old, so I am using this sport as a means to improve my life.” Sure that is truthful, but it ends conversation about all the fun side effects of this sport, like cycle shopping, nutrition, running and secrets to getting better rest. All the other nations’ athletes were close by. I got a cool photo of a group from the UK getting their photo taken by an Austrailian. That said, the most impressive athletes are the Iranian women. They are running in full Iranian garb, with their heads completely covered. There was a group of us who cheered those ladies on as they passed us in transition. I yelled at them, “You are inspiring other women. Keep going!” They may or may not be heroes in their own country, but they are rock stars, here. 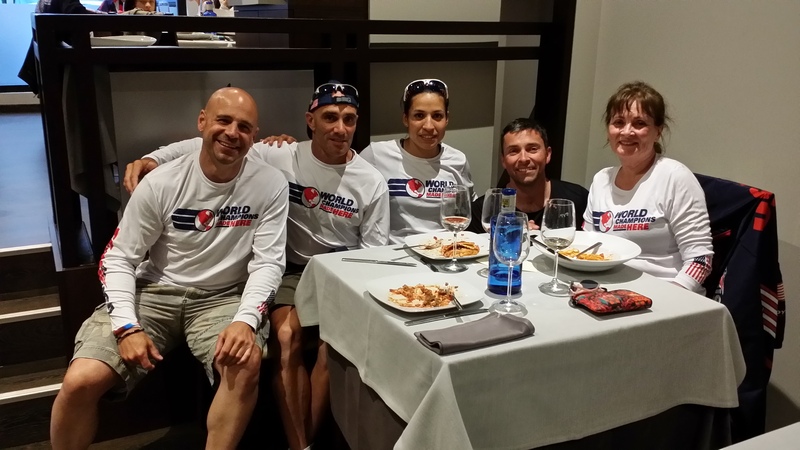 The event that made the biggest impact today was the paraduathlon World Championships that were held a day in advance of the main competition. Men and women who lacked either a limb, limbs or a sense, all competed on the same running and biking course that mainstream athletes did. Time after time, I would see a man or woman on the course, at the same or higher extertion levels as the rest of us “normal” competitors, but they would be fighting a bigger battle. A lone French man, with stubs for arms, in the middle of his second run, passed by. His effort levels were at maximum. I looked at him and wondered how difficult it must have been to cycle with no arms. Yet he was already into his second run, meaning he had done it. Next came a woman with an artificial leg, limping into her second run. I can’t imagine the effort she exerted to cycle up the hills that lead out of Pontevedra with only one leg to help her pedal. As she took her very altered gait past a group of us, I exclaimed, ¨that is a courageous woman, right there.” Don’t remember what country she was from, but that is kind of the point. It is here that we set aside our regional differences and look at each other, in the raw, at the deepest levels of humanity. Who she was, where she was from and her path were not important, in the moment. What mattered was her public display of effort. She was heroic and fully committed to her effort. The next athlete passing by did my heart in. A young man with no legs came into view. He was in a wheel chair/cycle. At the moment I saw him, he was attempting a climb up the only hill on the run course, and it wasn’t much of a hill, to begin. It wasn’t even a tenth of a mile long, and it was straight. That said, he was at a great effort…greater than anyone I had yet seen. His pace was below that of someone walking, and with every motion of his arms to move his chair, sweat came off of his brow, down onto to spot in his chair where his legs should have been. An older woman was walking on the side of course, carrying a bag of something on her person. She was walking faster up the hill than he was going. The juxtoposition of that old woman, casually walking against the young man at 110% effort took my heart over the edge. With every push, the sweat would flow, while the old women kept gaining ground on him. I couldn’t hold my gaze. I turned to the wall and poured out tears instead. What grace has been given to me that I can “go” at the World Championships using my “normal” body. Even in my most challenging workouts to prepare, whether it be hot or cold, cycling or running, or anything in between, I had never hit an exertion level that matched that young man´s effort on that hill. And he persevered. He went beyond reasonable with his effort. He grunted and pushed forward with every arm motion, like his life depended on reaching the top of that hill. How do I know this? When I stopped crying and turned around, he was gone. I have others in my life who are heroes, but on that day, in that moment, he was my hero. He wasn’t just a hero, but he was my hero. At uniform exchange on Sunday night, I am going to trade uniforms with that young man. I don’t know if he can speak English, but I will give him this blog address and let him read why I want his uniform. Next postDuathlon Worlds, part 2. Geri, Geri, quite contrary, how does your garden grow? What a memorable experience for you. So many emotions at once. We are truly blessed and want you to know we love you and look forward to cheering you on in St. Paul.